Leucoderma, also known as vitiligo, is a rare skin disease characterized by white spots and patches. The white patch or spot is called as leucoderma and when it occurs without any preceding disease it is called Vitiligo. Leucoderma in literal term means white skin. This kind of condition is mistaken for another skin disease i.e. leprosy. Under this skin condition, certain parts of the skin gradually lose color leaving behind white patches. This occurs due to loss of melanin, a dark pigment which gives color to skin. It may begin with a small patch but slowly and steadily spreads throughout the body. This is not a dangerous or contagious skin disease. The actual cause is still unknown though numerous studies have been conducted on the subject. Some of the perceived causes are emotional stress, hereditary factors, worms, sunburns and physical illness. This skin condition can be aggravated due to diseases like hyperthyroidism, diabetes mellitus, pernicious anemia and Addison's disease. Symptoms of vitiligo include an often rapid pigment loss on several areas of the skin. The initial appearance of the white patches can be followed by a stable period without any progression of the condition. Later on, further cycles of pigment loss and stability may be observed. Vitiligo commonly affects areas on the skin that are exposed to sun, body folds, previous sites of injury, areas around moles, or areas around body openings. It is rare for pigment to return once the white patches have developed. 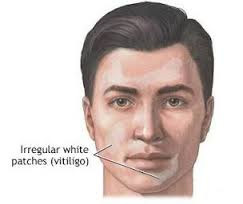 Vitiligo can also affect the eyelids and hair. Homeopathy treatment helps for Vitiligo leucoderma. And helps to prevent further recurrence also.